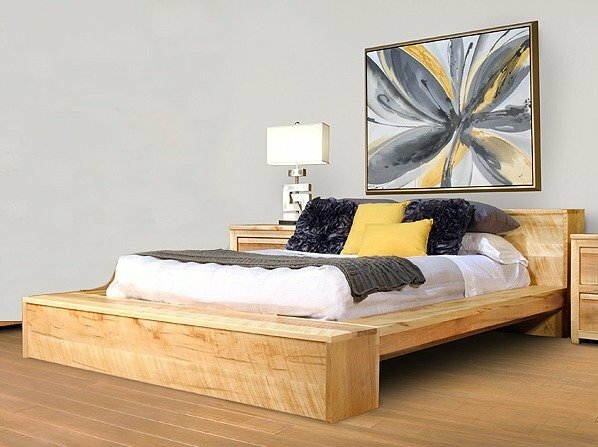 Consider adding the Ruff Sawn Hugo Platform Bed to your bedroom suite for added style and comfort. Enjoy uninterrupted nights of sleep while sleeping in your new solid wood bed. Unlike with cheap bed frames, your new solid wood bed will be strongly built and suitable for anyone looking to rest. This Amish bed is only available in rough sawn wormy maple wood, but there are a lot of different finish options available. Match this handmade bed with the rest of your bedroom decor for a beautiful finishing touch. Get in touch with one of our Amish furniture specialists today if you have any questions or concerns by calling in at 866-272-6773 or emailing us at Questions@DutchCrafters.com.